Squid doesn’t come to mind when you consider the targets of the world’s largest fishing fleets. However, over the past few years the magnitude and global scale of squid fishing fleets have become apparent. Due to powerful fishing lights used to attract squid to the surface these fleets appear on NASA’s night imagery like cities floating hundreds of miles offshore. Recent analysis of vessel movements shows that they are interconnected with hundreds of predominantly Chinese flagged vessels moving between fleets along the Peruvian Exclusive Economic Zone (EEZ) boundary, the South Atlantic, the northwest Pacific, and even the northern Arabian Sea. We’ve been monitoring the squid fleet fishing at the Peruvian EEZ boundary for some time. We noticed a handful of vessels in the fleet broadcasting false AIS locations. 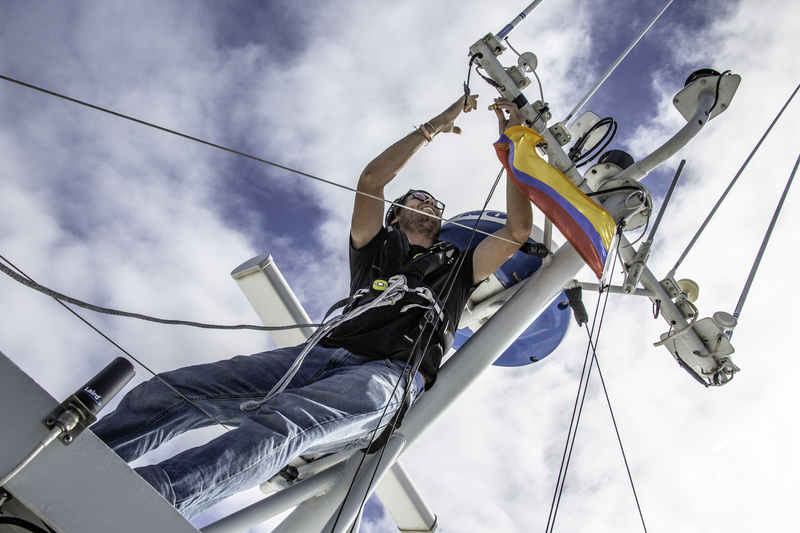 Then in 2017, we were puzzled when the entire fleet suddenly picked up and relocated 3,000 miles to the northwest of the EEZ boundary, to a remote area west of the Galapagos. 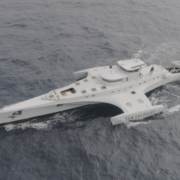 So as I boarded Sea Shepherd’s Brigitte Bardot, I was really curious to find out the real size of the fleet and why so many vessels appeared concentrated at this remote location. On September 12th, we set off from Panama City with some of us suffering from the rough seas as we steamed southwest towards the Galapagos. I was able to meet the very enthusiastic crew on the Brigitte Bardot, including a professional photographer, a drone pilot, and a fantastic vegan cook. We were also fortunate to be accompanied by Eloy Aroni, a Peruvian researcher who was just completing his thesis on tracking the squid fleet with nighttime satellite imagery from NASA’s Visible Infrared Imaging Radiometer Suite (VIIRS). After three days, we crossed into the Southern Hemisphere with the ship’s engineer taking a celebratory swim across the Equator. Later that afternoon, we sighted the desolate coast of San Cristobal Island, and after rounding the sheer rock cliffs of Sleeping Lion Rock, we entered the island’s main port. 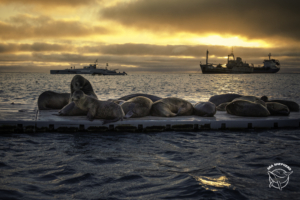 Sea Lions on the docks of San Cristobal with the Brigitte Bardot in the distance. We were held up in San Cristobal for a few days dealing with customs and inspections. This delay gave me a chance a to see bit of the island’s interior and review the latest information I had on the fleet we were tracking. Our data came from three sources, vessel AIS broadcasts, VIIRS night imagery, and interestingly two synthetic aperture radar (SAR) images of the fleet provided by Kongsberg Satellite Services (KSAT) as we were heading out. While SAR imagery is acquired routinely by the European Space Agency’s Sentinel-1 system over land and coastal areas it’s unusual to have imagery over the open ocean. So we were lucky to have access to a few shots of the fleet provided by KSAT from Canada’s Radarsat-2 satellite. This allowed us to make a comparison to our usual tracking sources for the fleet, AIS and VIIRS night imagery. Synthetic aperture radar covering a portion of the squid fleet provided by Kongsberg Satellite Services (KSAT). Those vessel detections outlined in green were found by KSAT to align closely with AIS broadcasts. Detections outlined in red could not be identified confidently with AIS. 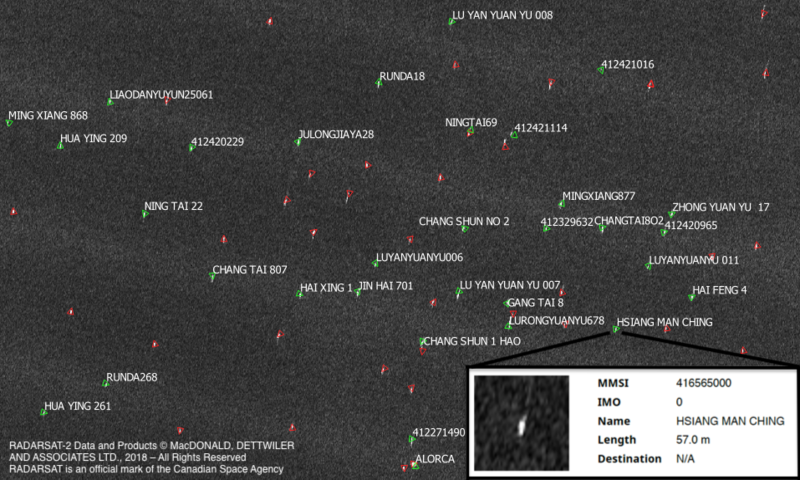 The inset on the lower right shows at larger scale the detection of the squid jigger Hsiang Man Ching. The large number of unidentified (red) detections was likely due to limited satellite AIS reception and does not necessarily indicate that the vessels were not broadcasting AIS. AIS gives vessel locations and (usually) vessel identities. VIIRS gives us an approximate count of the number of vessels with their fishing lights lit up on a particular night. However, with no law requiring AIS use and the fact that VIIRS imagery is relatively low resolution (and still untested against this particular fleet), we suspected that these data sources might be giving us an incomplete picture of the total fleet activity. For these reasons, it was useful to make a comparison with the two SAR images since they should pick up every vessel present in the area, provided they are metal and above a certain size. Ultimately, comparison between the SAR vessel detections and total AIS broadcasts showed that despite a number of SAR vessel detections that could not be identified with AIS (outlined in red in the figure from KSAT above) the total number vessels detected by both systems was approximately the same, indicating high AIS use for the fleet, but also with a few clusters of radar detected vessels not associated with AIS. After refueling on Baltra, a barren island with a former US military base, and installing a new satellite communications system, we set off on September 19th. In the evening we rounded the north cape of Santa Isabela Island and headed west into a vast stretch of the open Pacific. Ahead of us the nearest land was 3,000 nautical miles away in the Marquesas Islands of Polynesia. 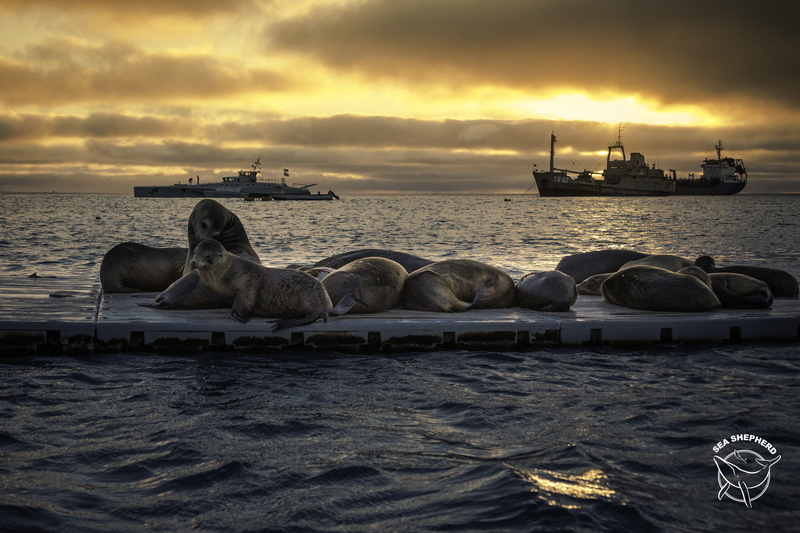 We would be venturing across some of the most remote surface of our planet on a voyage that would launch Operation Mamacocha, Sea Shepherd’s newest campaign fittingly named after the Incan sea goddess. A shift in priorities of the EPA under the current administration has raised awareness of an increase in oil and gas permitting across the USA. However, the increase began before the current administration. Although the federal government controls most regulations and laws that affect permitting, other factors such as global oil and gas prices, advances in drilling and production technology, and state governments’ willingness to accommodate investors have an effect on permitting and investment by energy companies. It should be pointed out that permitting does not necessarily indicate drilling as companies can request permits but then hold on to the permits until either eventually drilling, requesting a new permit, or selling the permit to another company. This can tie up land for decades and is covered in more detail by The Wilderness Society’s report: “Land Hoarders: How Stockpiling Leases is Costing Taxpayers”. Wyoming has an economy that is built on coal and oil, but in the 80s and early 90s it was suffering from an oil glut that caused prices to drop. 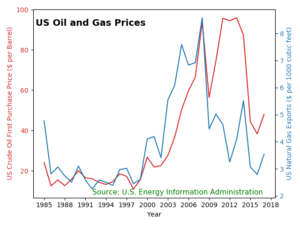 As prices began to recover throughout the 1990s and 2000s and eventually boom (Fig.1), some companies sought to diversify into natural gas (read more in James Hamilton’s paper “Causes and Consequences of the Oil Shock of 2007-08”). 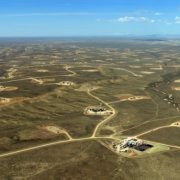 Many began to drill for gas in the coal fields of Wyoming, and to apply the relatively new technology of hydraulic fracturing (“fracking”) to extract natural gas from previously uneconomic, low-permeability sandstone and shale reservoirs found throughout the Rocky Mountain West. Figure 1. 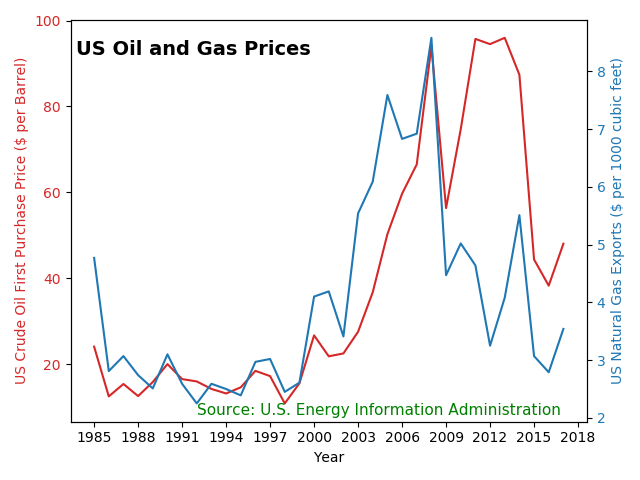 Oil and gas prices since 1985. The oil and gas boom ended abruptly in 2008 when the effect of the global financial crisis reached the oil and gas markets and prices plummeted. To better understand the effect these events had on Wyoming, I analyzed permits for new oil and gas wells, issued by the state over the past 20 years. This data is freely available from the Wyoming Oil and Gas Conservation Commision website: http://wogcc.wyo.gov/. First, I should point out that this data has inconsistencies and holes, due to apparent data entry errors like missing or incorrect dates, missing latitude or longitude, typos, etc. Unfortunately, this meant nearly 24% of the total permits had to be left out of my analysis. Some errors still remain, as seen in this map of permit applications received by the state (Fig. 2). Each county is colored differently and there appear to be some permits which either have the wrong county listed or incorrect map coordinates. Figure 2. Distribution of oil and gas drilling permit applications, color coded by county. What immediately stands out is the relatively densely-packed permits in Campbell county, in the north-east of the state. When I looked closer at this county over time, I saw that most of the permit applications were submitted during the beginning of the boom of 1998-2008. This is quickly followed by a sharp drop around 2000, the time hydraulic fracking made drilling in other parts of the state (and country) more profitable. The original method of coal bed methane drilling was considered uneconomical compared to this new fracking method. At that time, I saw a rise in permit applications across other counties (Fig. 3), but far more subdued than the earlier rush, possibly because fracking made deposits across the country viable and so the increase was more widespread across and outside Wyoming. This is just a theory though, these could easily be due to business strategies of companies “capturing” land before their competitors. Figure 3. Applications for oil and gas drilling permits received over time by county. 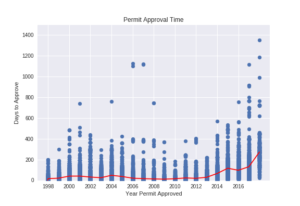 The rate of permit applications slows for all counties as the boom ended around 2008 with a short-lived rise leading up to 2016. The boom and bust periods can be seen more clearly when I looked at the overall quantity of permit applications across Wyoming (Fig. 4). Figure 4. Total number of oil and gas drilling permits applied for in Wyoming. The initial rush of the boom was followed by a dip and second climb as fracking technology took off. This is followed by the bust of 2008. There is a slight rise again around 2016, but it drops off by 2017. The effect of this activity is closely reflected in unemployment figures for the state (Fig. 5). Considering that I am looking at permitting however, and not drilling, this correlation should be seen as a reflection of oil and gas companies’ business activities in a holistic sense. Figure 5. Unemployment rate for Wyoming over the past 20 years. Initially, there’s an overall steady decline in unemployment as the boom sweeps up employees but this rockets up once the bust comes along. Interestingly, between 2012 and 2016, there is a steady rise in permit applications which is reflected by the steady drop in unemployment but this is interrupted by a bump in unemployment around 2016. The restoring of the unemployment level after 2016 is not reflected in the drop in permit applications, however. Those appear to drop off. 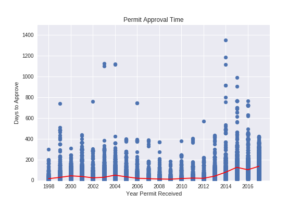 Although there are booms and busts, the overall number of well permits is constantly increasing (by simple fact of the number of new permits applied for always outweighing the number of permits expiring). The animated image below (Img. 1) shows the growth of oil and gas permit applications as companies move across the state. Graphs and maps give us a good idea of the trends but sometimes it is even more helpful to see the physical reality of these numbers. This is an area in the most heavily permitted county, Campbell (Img. 2). Image 2. Comparison of an area of Campbell county from July 1999 to July 2018. As well as the dramatic increase in well pads (i.e., drilling sites), these images show the addition of access roads threading across the landscape. What this data doesn’t show is the large amount of orphaned wells that were left behind after the price of oil and natural gas dropped in 2008. This has left a legacy of about 3600 abandoned wells (scroll to bottom for total number of orphaned wells currently tracked by Wyoming Oil and Gas Conservation Commision). Often the state, and therefore, the taxpayers, are left to handle this burden because the responsible companies are either unknown, unable to cover the cleanup costs, or have declared bankruptcy and disappeared. Understandably, the state would prefer to see the wells operate once more rather than paying considerable amounts of money to seal them up and restore the land. But these aging, unsecured wells pose a threat to the environment and to public health. Many of the coalbed methane wells built at the beginning of the boom were approved with permission to dump untreated “flowback water” on the surface. The companies convinced the state that this fluid, coming straight from the coal seams targeted by the drilling, would be beneficial for the parched land even though most of the untreated fluid was highly saline. Also, the effect of flooding the land with large volumes of water was extremely unnatural to the existing ecosystem. Many areas that were normally good for grazing became unusable because they were flooded with this salty water. Land that was adapted to little rainfall and snowmelt was suddenly exposed to a constant flow of brine. The companies pushed the idea of plentiful of water for agriculture and wildlife to drink while downplaying the issue of the quality of the water. The state also towed this line while court battles challenging the “beneficial use” permits, led by landowners and conservation groups, were upheld in court. Eventually, they implemented a water-to-gas ratio cap on surface discharges since many of the wells were producing plenty of salty water but little or even no gas at all. 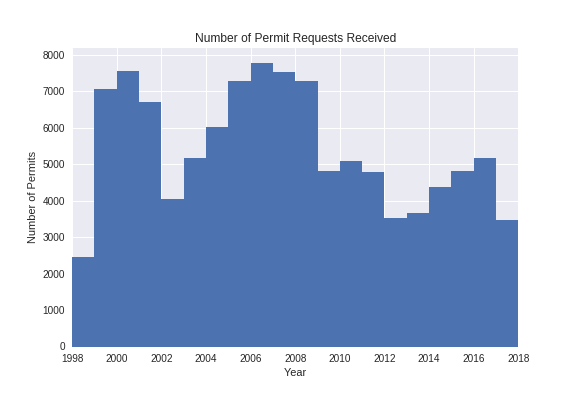 One other trend that I discovered while scrutinizing the permit database was the time it took to process these permits (Fig. 6 & 7). 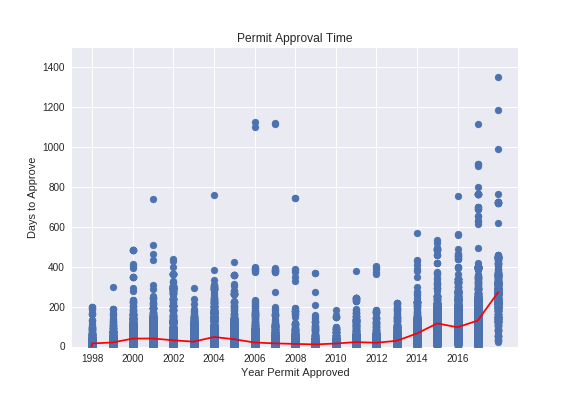 Plotting permit approval times at first appears to show a distribution that follows the general trends that I’ve seen so far, tracking the boom and bust periods. For comparison, I plotted these for both the year of permit application (Fig. 6) and year of approval (Fig. 7). Figure 6. Permit approval time arranged by year of application. Figure 7. 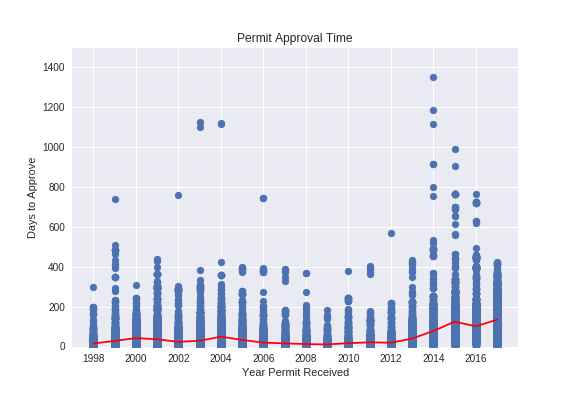 Permit approval time arranged by year of approval. The red lines track the annual average wait time and give a clearer picture of the trend. The spread of wait times fluctuate far more than the actual average wait time. Although the average does not appear to fluctuate much, the scale is a little deceptive as the average wait time extends from 15 days in 1998 to 40 days in the year 2000. The average wait time appears to initially rise with the start of each drilling boom but even out fairly quickly. This changes later when the average wait time climbs sharply around 2013. By 2017, the average wait time has increased considerably to 130 days. These trends offer insight into the recent history of oil and gas permitting activity in Wyoming. 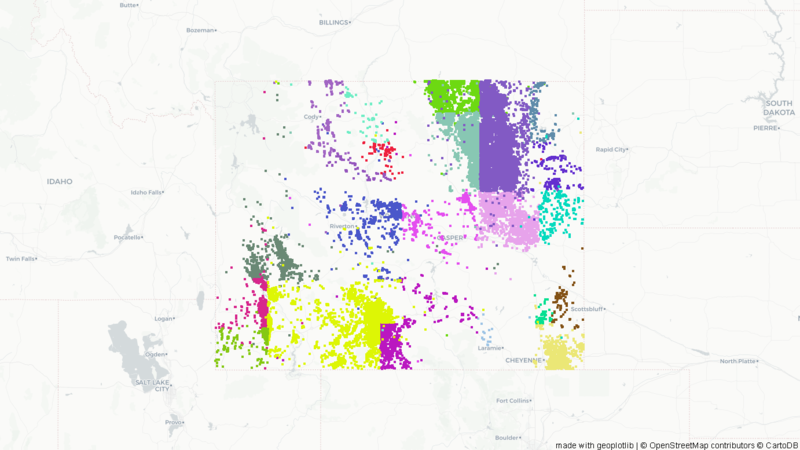 It should be noted that although there was a lot of ‘noise’ in the data that I had to correct or discard, the remaining data helps give me a clearer sense of how oil and gas development is driving change on Wyoming’s landscape. My analysis has been based purely on the history of permitting in Wyoming, not actual drilling. For an analysis on drilling, please look at the Fracktracker Alliance’s page on oil and gas activity in Wyoming. I hope you’ve enjoyed this breakdown of permit data for Wyoming. I hope to take a similar look at other states’ drilling permits, so stay tuned! 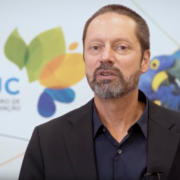 Check out these standup interviews John had with Globo News when he presented at the Brazilian Congress on Protected Areas (CBUC) in August. How can we illustrate the problem of overfishing from space?